Claudia Rivera April 26, 2016 May 3, 2016 No Comments on Register for First-Person Journalism for Fall 2016 @ Lincoln Center! What can explain the enduring popularity of Tom Wolfe and Hunter Thompson and Joan Didion? Brilliant journalism, incisive insight, and provocative ideas. First-person journalism is nothing new. As part of the New Journalism movement, reporters like Wolfe and Didion have infused their storytelling with their personal experience and observations. Today, the digital shift in journalism and explosion of social media have brought a new wave of first-person journalism to the web. 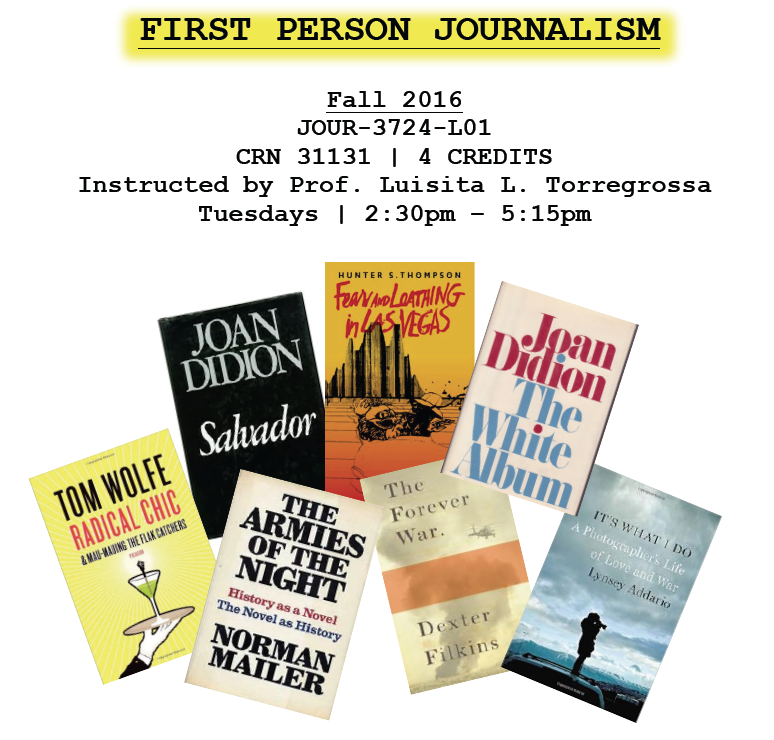 This course will explore the history of first-person journalism and help students use their first-person perspective to bring reported pieces to life. On this note, this course will not be limited to personal narratives. Students will also work on reported stories in which their experiences as journalists and citizens impact the structure and content of the story. This course will be taught by the newest member of our Journalism faculty, Professor Luisita Torregrosa. Torregrosa, a journalist and book author, is a former assistant national editor at The New York Times. Her work has appeared in The New York Times, The Washington Post, Vanity Fair, Conde Nast Traveler and other national publications. Her memoir, The Noise of Infinite Longing, received the first prize for nonfiction from the Latino Book Awards in 2004; it was named one of the top 10 books of the year by the Fort Worth Star Telegram and one of the top 10 literary debuts by L.A. Weekly. Her second book, Before the Rain: A Memoir of Love & Revolution, was a Lambda Literary Foundation finalist in 2013. We are thrilled to welcome her to our faculty and urge you to take advantage of the unique opportunity to study with her! Register for Interviews & Profiles Course for Fall 2016 @ Lincoln Center!